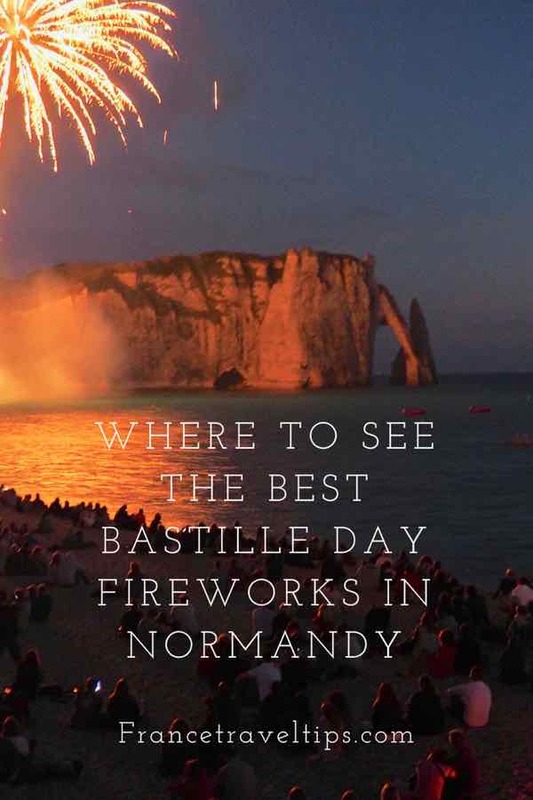 Do you want to see the best Bastille Day fireworks in Normandy? Start planning your trip to Etretat because I don’t think anything can top what I recently saw in this seaside town which is surrounded by some of the most famous falaises (cliffs) in the world. I looked into other places, but I think my plan for enjoying a lovely dinner and seeing impressive fireworks worked out beautifully. 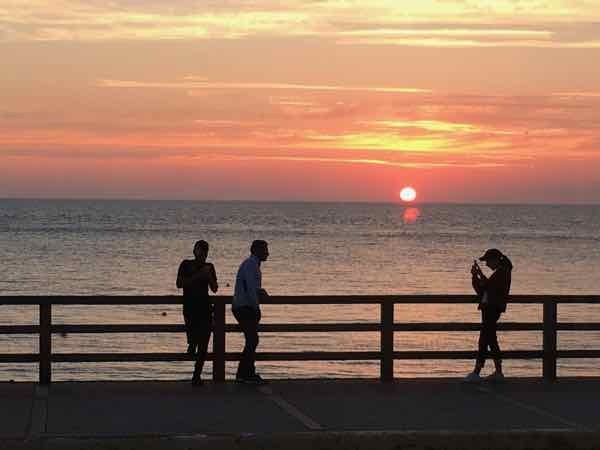 If you’re going to celebrate the most important day for France, do it in Etretat. La Fete Nationale is France’s national anniversary of the storming of the Bastille, which took place on July 14, 1789. To Anglos, it is called “Bastille Day” and throughout France, celebrations take place with fireman’s balls, parades, music, and fireworks. 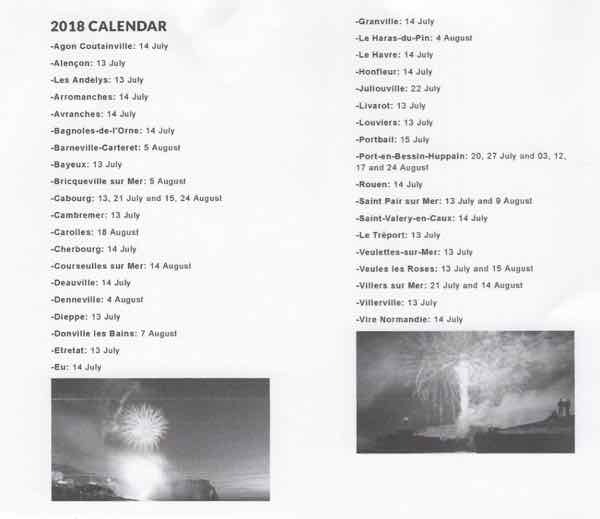 The fireworks in France take place on either July 13 or July 14. Ironically, my birthday is also July 14. (No, I don’t think it’s a coincidence.) While I haven’t been all over France to experience every town’s Bastille Day celebrations and fireworks, what I saw in Etretat were pretty impressive. Until I see something better, Etretat has my vote. 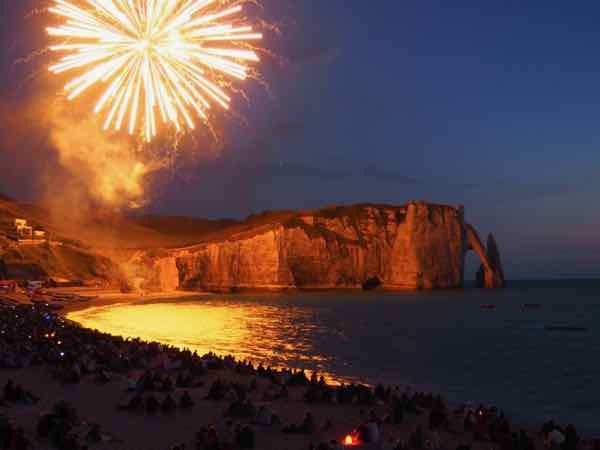 I really believe the best Bastille Day fireworks in Normandy take place in Etretat because, quite simply, you are not just getting a show of fireworks in the sky. The location of the displays is perfectly positioned right by the falaises (cliffs)—in this case, Falaise d’Aval. You are getting a brilliant show of pyrotechnics and every time there is an explosion, the falaises are illuminated in various colours. 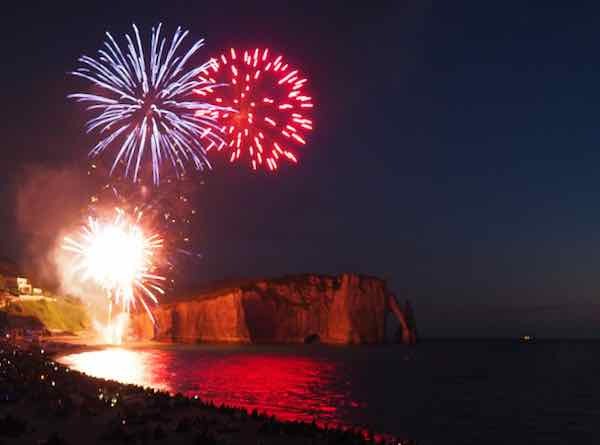 My Airbnb hostess, Sevérine, told me that there would be fireworks in Etretat on July 13, with the best views from the beach. She added that on July 14 there would be fireworks in nearby Le Havre. The Normandy tourist board actually published a list of towns and the dates they were having their fireworks, so I had a lot to choose from; however, as Etretat is so picturesque, I decided to stay in town for dinner and fireworks on July 13. 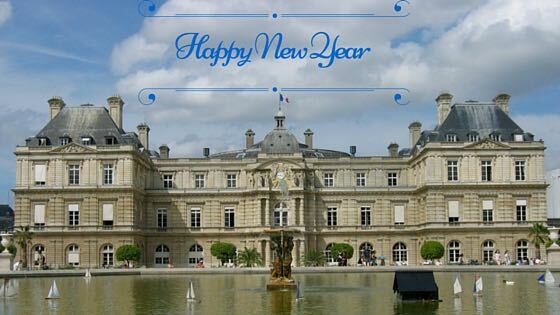 On July 14 I had planned to go to Le Havre to see those fireworks but had a change of plans. Severine was very helpful in making recommendations. As I mentioned in a previous post, her first suggestion was to have dinner at the Restaurant du Golf Etretat. They only took phone reservations, so I waited until I was in France to call. Unfortunately, they were having a private party, so there was no chance to eat there. 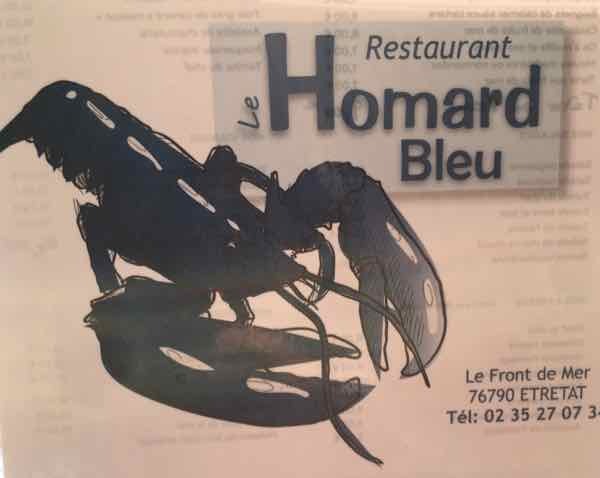 My Airbnb hostess then made another suggestion: Le Homard Bleu. This casual, seafood restaurant is located right on the boardwalk at the north end. 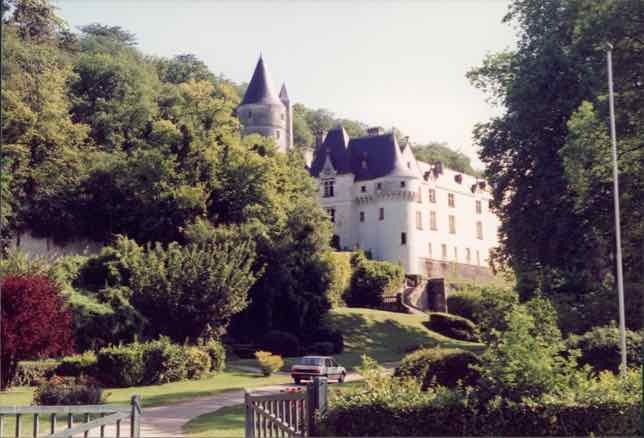 It has unobstructed views of the Falaise d’Aval and was the perfect location to see the fireworks. 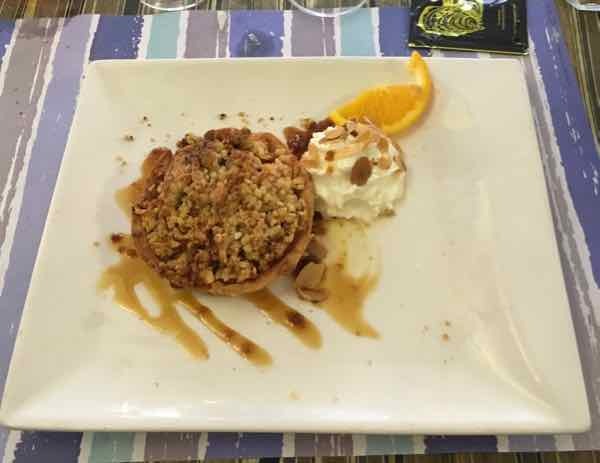 When I arrived in Etretat, I walked over to the restaurant and made reservations. I think I got a weird look as I said I only needed a table for one. Sometimes restaurants are so shocked to see a single person eating alone. Oh well. I didn’t care. 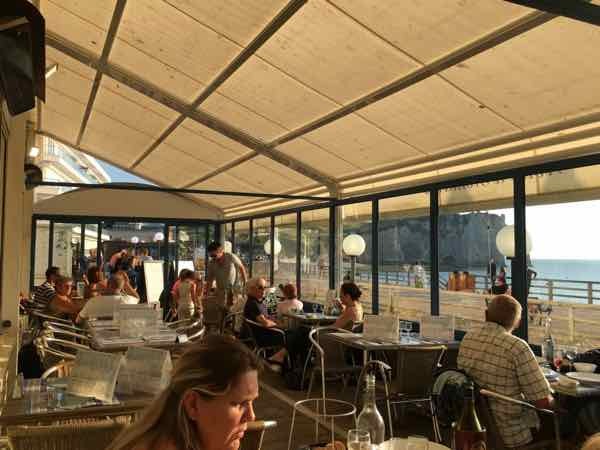 On July 13 I arrived for my 8:30 pm reservation and was seated on the enclosed terrace, facing the sea. The sun was shining on my face until about 9:30 but I didn’t care. The view and the setting sun made it worthwhile. 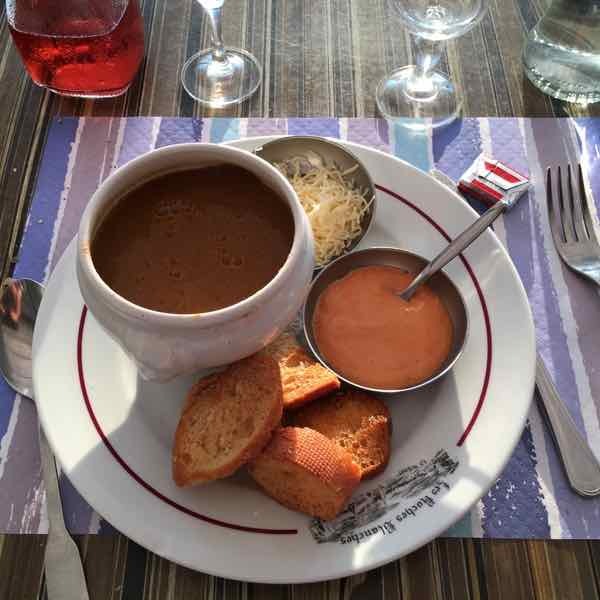 Appetizer: fish soup: the soup was made in the traditional French way. with croutons, Gruyere cheese, and aioli. It was very good. 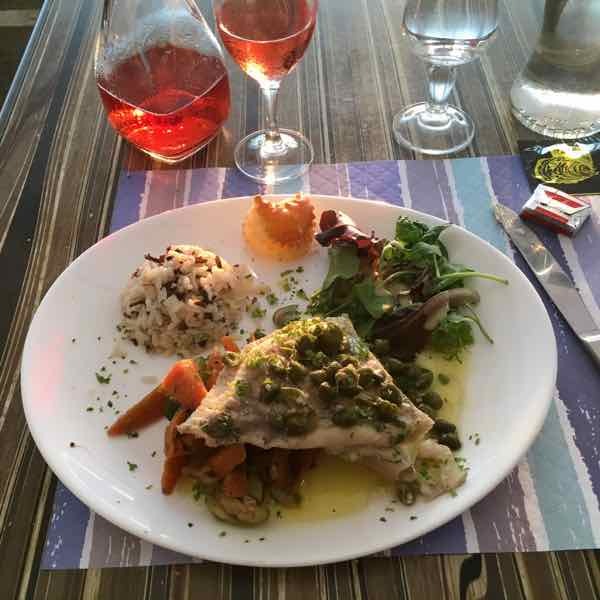 The main course that the waiter had recommended was just OK. Aile de raie is skate wing fish, a mild white fish that was cooked with capers. It is cooked with butter and in this case, was seasoned with capers. I think they overcooked it as the fish wasn’t as tender as it should have been. The Sun Sets. Let The Fireworks Begin! The sun started setting at about 10:00 and I was pretty impressed not only by the color of the sky but by the lights that slowly began to light up the falaise. Even without the fireworks, the cliffs would have been beautiful to see at night. 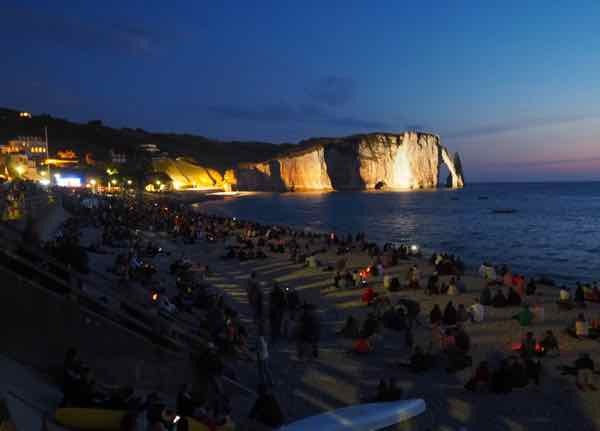 So, if you can’t make it to Etretat for the night of fireworks, come out at night anyway to see the sunset and the cliffs lit up. I finished dinner at about 10:30 and decided to go onto the boardwalk in front of the restaurant. Down below the boardwalk were hundreds of people camped out on the beach—-the very HARD beach. This is not a sandy beach but a beach that has fairly large, smooth rocks. It’s not easy to walk on them and when you do, there’s a loud clacking sound. You really need some good padding and a blanket to sit on the beach. Just be forewarned. The other thing that surprised me was that although there were a lot of people out to see the fireworks, it did not feel crowded. There was lots of room on the boardwalk to stand and watch the spectacle. The fireworks lasted about 25 minutes. No music, just an explosion of colors that lit up the Porte d’Aval. It’s an event I’ll never forget and a wonderful way to start my birthday. Here are some photos and a (very short) video. On July 14, I had intended to visit Le Havre, have dinner there and watch the fireworks but I decided to skip that. Rightly or wrongly, I decided that I had seen the best fireworks in Etretat and nothing could top them. It was really the cliffs that made the show that much more impressive. I also wasn’t really keen on going to Le Havre as many things were closed. I decided I could visit Le Havre another time. Instead, I visited the town of Pont-Audemer and then Honfleur. I’ll write about some of the highlights at Pont-Audemer, sometimes referred to as the “Venice of Normandy”, another time. I went to Honfleur because they were also having fireworks in the lovely port town. Unfortunately, Honfleur was packed. I had to park a fair distance out of town and when I got there, I almost didn’t recognize the town. It had been 14 years since I was last in Honfleur, but I think it was the hoards of tourists (like me) that shocked me. All the restaurants were crowded and it was incredibly busy, particularly in the harbor, so it was not a pleasant experience walking around. I made a note to myself never to visit Honfleur when there is an event going on. I decided it wasn’t worth hanging around another 6 hours to see the fireworks at 11:00 and then drive another hour to get back to Etretat. 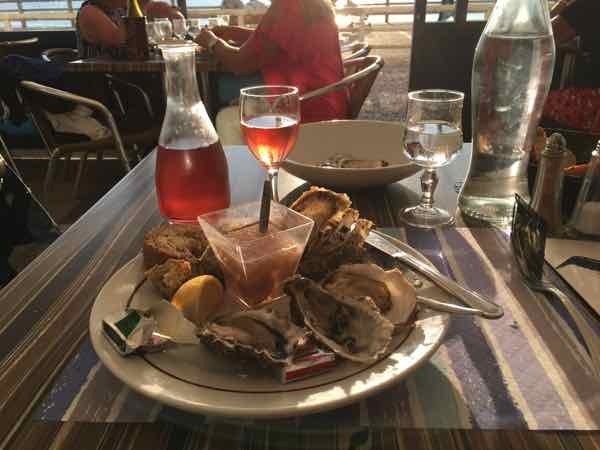 So, I headed back to Etretat and celebrated my birthday and Bastille Day with a Calvados crepe (crepe with vanilla ice cream and Calvados—apple brandy) and a glass of rose wine. A relaxing way to end one’s birthday! If you can, stay the night in Etretat. You won’t have to deal with parking or traffic and it’s really nice seeing the cliffs in the morning when it is quiet. Check out my post about the Airbnb I rented. It was perfect. 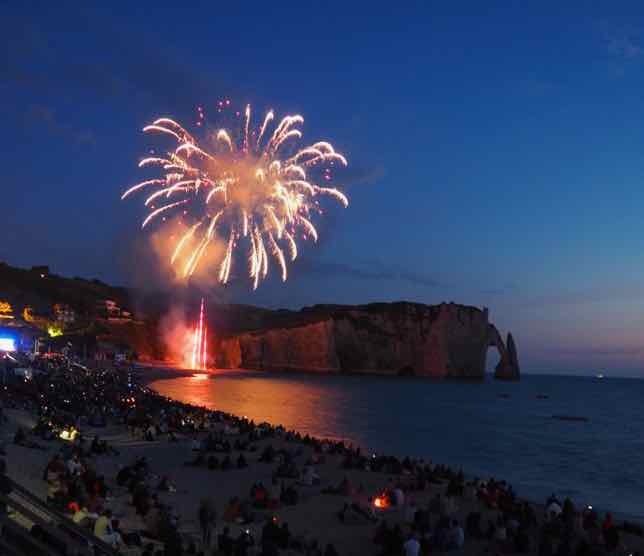 Check with the Normandy tourism board to find out when the Bastille Day fireworks will take place in Etretat: July 13 or July 14? You can also message them on Twitter or on Facebook. If you decide to sit on the beach, bring something soft to sit on as there are a lot of rocks (no sand).